Football is an explosive sport with very specific energy needs. When thinking about football players training programs most people imagine a big, strong, athletic looking player lifting weights or pushing a sled. Football is about much more than lifting weights and driving sleds down a field. Football players have very specific demands on their body. 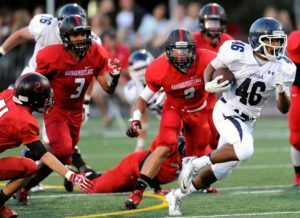 Needing to preform many short, explosive movements, over the course of a game, football is primarily an anaerobic sport. More and more coaches are realizing the importance of aerobic cardio work in order to help their athletes maintain their stamina during practices and games. Understanding the difference between these energy systems and how to properly fuel your body can make the difference between being an average player and an all-state player. 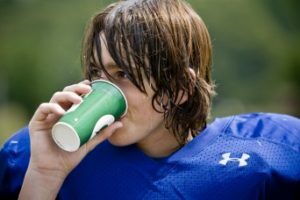 Proper hydration is a crucial aspect of a football players nutrition program. The primary fuel for football is carbohydrates. In order to compete optimally a football player requires 55% to 60% percent of their daily caloric intake to come from carbohydrates, 15-25% from protein and 15%-20% percent from fat. In other words, your diet should be 2/3 carbohydrates and 1/3 protein & fats, with an emphasis on healthy fats. Not all carbohydrates are created equal though, a whole wheat bagel is a better option than a doughnut. Pasta and sweat potatoes should be chosen over fried foods like french fries or breading on fried chicken. In addition, proper hydration is crucial for athletic performance. Dehydration can cause over-heating, reduced reaction time, cramps, muscle tears and decreased strength and endurance. Hydration isn’t just for practice and games, staying hydrated all day is very important. Sports Specific- We take into consideration the energy and hydration demands of each individual sport. With all of our football players we also take their specific position into account. Support 7 days a week- We provide daily coaching. Each of our clients has access via text, phone and email to our staff everyday. If you have a problem, cheat on the plan or have a question you can reach out at any time! We will help you every step of the way.